Bernie Sanders supporters have a problem. Super Tuesday is upon us. Their Presidential candidate is looking to lose the nomination just as the voting has just begun. Oddly enough, it turns out that Black Lives DO Matter…More specifically: Black Votes Matter. This year, the Black (and Latino) vote looks like it will be just as pivotal as it was in 2008 and 2012. Both Hillary Clinton and Bernie Sanders are working hard for that vote but the Senator from Vermont has an uphill battle to climb. That’s what happens when you not only suddenly become a Democrat after a lifetime of being independent, but also when you suddenly have to actually interact with real black people after a lifetime of doing so tangentially. Up until now, I’ve been undecided. While my “stay woke” black friends jumped on the Bernie Bandwagon long ago, I sat back and watched, listened and observed what all of the candidates, Democrat and Republican, had to say. With the exception of John Kasich, nothing the GOP had to say swayed me to their side. And even then, Kasich’s position on Social Issues borders on regressive and downright crazy. So it was back to the Dems: Clinton and Sanders. I’ve had problems with Clinton for years. From her close Obama-like ties to the Banking Industry to her pro-interventionist approach to foreign policy, suspect is an apt word to describe how I viewed the politician. At the end of the day, she’s a politician. A shrewd one. Maybe not as nimble on her feet as her husband Bill Clinton or her former rival-then-boss Barack Obama, but for decades she’s navigated the waters to still be on course to the presidency. When confronted about her ties to the Banks, I was somewhat satisfied with her responses. She said that if she had been “bought and paid for by the Banks,” people should be able to point to policies or votes that demonstrated this coercion. The best that people could come up with was a single bill that she opposed as First Lady, but voted to pass as Senator. That bill had been significantly changed in that span of time to remove many of the things she had originally opposed, yet the record does show that she voted for it nonetheless. That’s a strike but I wouldn’t call it a Knockout. I voted for President Obama twice knowing that he had voted for similar bills in the Senate, that he had massive donations from “The Big Banks” and that he was had doubled-downed on the military drone strikes in the Middle East. Why is he much different than her? He got my vote, twice. I also observed that many people seemed to place 100% of the blame for mass incarcerations on Hillary Clinton, by way of her husband Bill who was President at the time. It’s true that she lobbied hard for the 1994 Crime Bill that many black activists seem to point to as the impetus for mass incarcerations. Here’s the thing though, when I researched this ongoing meme by Bernie Sanders supporters, it turns out to not be supported by history. States preside over the great bulk of the US justice system. So it’s actually state policies that fueled mass incarceration….Federal criminal justice policy, including much of the 1994 crime law, focuses almost entirely on the federal system, particularly federal prisons….In the US, federal prisons house only about 13 percent of the overall prison population. And there’s one other thing to add to that: by 1995, when the crime bill took effect, state and federal policies had long since been committed to mass incarceration. Between 1978 and 1995 the prison population had already increased by more than 250 percent. Between 1995 and its peak in 2009, it increased only another 40 percent—and even that was due almost entirely to policies already in place. “We had gang warfare on the streets. We had little children being shot dead on the streets who were just innocent bystanders standing in the wrong place,” he said. In response, Clinton said, the bill increased the number of police on the streets and enacted gun control legislation. But decades later, Clinton believes the results of the law were mixed, at best. On top of that, many leaders in the Black community supported the bill. You know who else voted for the 1994 Crime Bill? Senator Bernie Sanders from Vermont. So why does Bernie get a pass and not the non-elected official Hillary Clinton, who had no power to pass or fail the bill? Even every liberals most beloved President, Barack Obama “Outspent And Out-Arrested George W. Bush On Marijuana.” Why did he get a pass on mass incarcerations over the years? Don’t get me wrong. Hillary Clinton is by no means a perfect (or even consistent) candidate. She also isn’t the most Liberal or Progressive like Bernie Sanders, the self proclaimed Socialist. However, neither am I…or the majority of Black voters in South Carolina, for that matter. Exit Polls after Clinton’s 50-point blowout in South Carolina showed that a majority of voters identified themselves as Moderates. Take a look at this very revealing 6-minute roundtable discussion with Black voters of various ages, genders, professions and demographics in South Carolina. These voters reveal that it takes more than repeating Socialist talking points to get a person to connect with a candidate. Bernie (and his sidekick Killer Mike) scream a lot about inequality, but his words don’t seem to be connecting with people of color who are actually struggling. Killer Mike may be the first non-politician black man that Sanders has even had a meal or conversation with since the civil rights movement. That’s not to say that Hilary Clinton has been Iyanla Vanzant over the years, crying on couches with black people as they spilled out their sorrows…But at least she’s been connecting with them consistently since she was a law student. Unlike Bernie, she hasn’t suddenly recognized that black people exist and started campaigning with Nicki Minaj. Did you catch that Bernie Sanders is never actually seen with any regular black voters? Not even archival photos? Sure you can find him in photos with politicians like Jesse Jackson, when he ran for President. But average everyday black men, women and children? Then you see that Hillary has been photographed being all over the concerns of African Americans for decades. Even the mothers of unarmed black men killed by police endorsed her and snapped photos. I’m not going to falsely claim that Hillary Clinton was doing much better in this area at the time (she wasn’t), but this goes to show that contrary to what Killer Mike heavily implies, Sanders had not been throwing garbage cans into the windows of Italian pizzerias over the years. People that are “Feeling the Bern” often say: “Well, Hillary has name recognition because she’s been in government so long.” So has Bernie Sanders. He’s not a new young buck, fresh on the scene like Marco Rubio. Bernie has served in congress since 1991. So even after 25 years, Bernie Sanders doesn’t have a relationship with the Black community. You can’t make up that gap in just 6 – 10 months of campaigning with a rapper. One could argue that Barack Obama did just that. Many average black people didn’t knew who he was when he ran for President. But again, once we saw proof that he had worked closely with the black community in some form (social work in Chicago), we were more willing to hear his policy ideas affecting us and the community’s plights. That brings me to Bernie’s gift bag: Free College, Free Health Care, Break Up the Big Banks, Taxes on Wall Street. For me, a more moderate guy who has worked hard for everything I have (including this awesome website), that wish-list doesn’t do much for me. True, I want “a less rigged system,” as Bernie repeatedly says. I’m just not convinced that giving free college to people will be the magic solution. I could be convinced otherwise, but through his yelling at me, Bernie hasn’t articulated and delivered his message well enough to get me on his side. Then the terrorist attacks and foreign policy issue came up. This is an area where even Bernie Sanders admits that he’s seriously lacking. So with us Georgia voters set to cast the ballots on Super Tuesday, I have to make a decision on who to vote for. At this point its moot in Georgia, Clinton already leads Sanders by at least 20 points here. So any votes for him here would likely be a symbolic gesture. To be honest, any votes for him from here on out may be symbolic. The electoral college math appears to be on Secretary Clinton’s side since her victory in South Carolina. While it may be over for Bernie Sanders, he definitely helped influence the election and steer Hillary Clinton a little more left than she had been originally, which is a good thing. While I may not be in love with her as a potential President, I’ll take her (and even Bernie Sanders) over Donald Trump any day. Yo @Nick Delmacy , this made my day. I won the argument over @Ockydub. You summed up everything i've been yelling for months now. This first archival photo has been authenticated by the photographer who took the photo and TIME magazine. 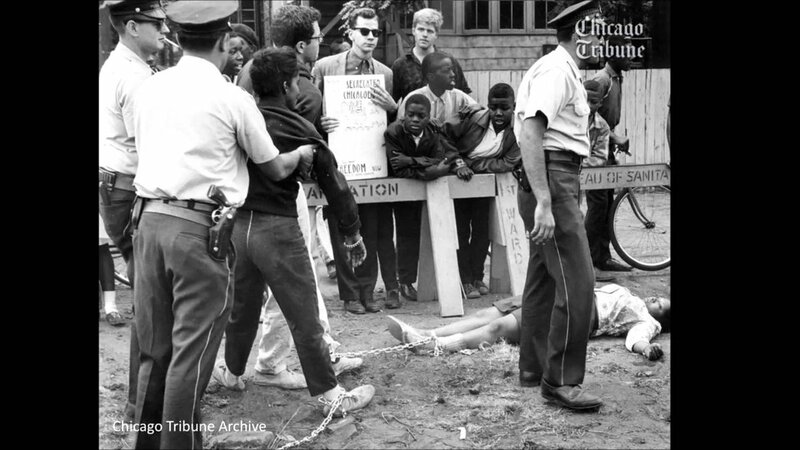 This second archival photo shows Sander's ankle tied to the Black female protester on the ground. These are two archival photos of Bernie Sander with Black people that many have known about for since the middle of 2015. Maybe this was left out of this post because these Black people are some how not "average or everyday" voting Blacks? Ask yourself the questions; if these two photos are easy to find and all over the internet, why was this statement made in the first place? Are we to believe the super talented, internet savvy, self taught tech web administrator @Nick Delmacy couldn't find these photos on the internet and the back story that goes with them? Instead of spending time going through this post and picking each point apart; IF folks are curious and want to make up their owns minds they can find the facts on their own and not just cherry picked ones that fit a pro/anti argument. The information is on the internet, free and accessible. Obviously, the Cypher Avenue founders are not a monolith, and Ocky Williams is a proud unapologetic "woke" Bernie Sanders supporter. Flag on the play. You made a lazy false statement. Own it and stop acting like Hillary while trying to move the goal post. The rest of what you said fits the argument you are attempting to convey. There is nothing wrong with that, however other facts disagree with your views and information. OckydubFlag on the play. You made a lazy false statement. Own it and stop acting like Hillary while trying to move the goal post. Just say you'll vote for Hillary over Trump and nobody gets hurt. RolandGJust say you'll vote for Hillary over Trump and nobody gets hurt. NOPE…for somethings to get rebuilt, they first need to be torn down. Trump is the man to help do that. Yeah he confessed to me yesterday that since Bernie doesn't have a chance, he's voting for Trump to Bomb the System. And I suppose not voting at all is tearing down the system? OOOOOOOKaaaaaaay. OckydubNOPE…for somethings to get rebuilt, they first need to be torn down. Trump is the man to help do that. Here's your MAN Trump-just for you. OMG he is so Presidential. Vladimir Putin said he would vote for him. Trump is already improving diplomatic relations and he isn't even President yet. How can one not see Trump will "class up" the White House? I almost wish you didn't post this. He keeps reminding me who/what Hillary will have to face. I'm not excited about any candidate on any side. Whoever gets elected, in my opinion will be a one term president. I'd more than likely end up voting for Hilary vs. Bernie because while he does present some good ideas, he hasn't been clear on how they will realistically come to fruition. Don't get me wrong, I like Bernie more than Hilary, but I'm also a realist and believe that Hilary would be the best realistic candidate. But again, I'm not excited by either and my vote will be based on what makes sense logically….if that makes any sense…..if anyone is reading this…. Well if you are in Georgia today is the day. Bernie or Hillary. In the scenario that appears most likely to emerge from the primary contests, Clinton tops Trump 52% to 44% among registered voters. That result has tilted in Clinton's favor since the last CNN/ORC Poll on the match-up in January. But when the former secretary of state faces off with either of the other two top Republicans, things are much tighter and roughly the same as they were in January. Clinton trails against Rubio, with 50% choosing the Florida senator compared to 47% for Clinton, identical to the results in January. Against Cruz, Clinton holds 48% to his 49%, a slight tightening from a 3-point race in January to a 1-point match-up now. Sanders — who enjoys the most positive favorable rating of any presidential candidate in the field, according to the poll — tops all three Republicans by wide margins: 57% to 40% against Cruz, 55% to 43% against Trump, and 53% to 45% against Rubio. Sanders fares better than Clinton in each match-up among men, younger voters and independents. Well damn. Clinton only beats Trump nationally, at this time. Sanders beats ALL Republicans handily at this time. I did not realize that Sanders had such broader support. I have to really root for Trump right now. Yeah I am probably reading too much into it right now. In my opinion, @Nick, this is probably one of the best written article about the Presidential race I have seen in a while. I've had similar feelings about Berny vs Hillary and have made similar conclusions. The one aspect of the presidency I have to imagine (because, we'll never know until it happens), do the candidate have what it takes to work with a Republican dominated government leadership to get things done. Can this candidate achieve reasonable compromise or just stand in their opinion corner with nothing to show? AND Hillary also was beating Obama in many states / nationally when they were running against each other. Hmmm, nah, not by this point (March 1, 2008), not nationally at least. Clinton won a few more states after this point but it was pretty much over for her after South Carolina. I remember him and his pollution/littering commercials. Are you old enough to remember these? ColumbusGuyI remember him and his pollution/littering commercials. Are you old enough to remember these? Oh yes, yes I am old enough to remember those. Thank the techno deities for the likes YouTube and google that allows me to watch and download or save the bumpers and commercials from my long ago youth. Hillary Clinton…no thanks. The same woman who…with her husband…supported mass incarceration and the prison industrial complex. She used the term super predators as a code word to desctibe non white children…just as Giuliani and other reactionary politicians did. The crime bill of 1994 created the problems that black lives matter are attempting to address. Michelle Alexander’s book THE NEW JIM CROW slams Clinton’s crime bill and other reactionary measures that his administration endorsed. Her husband was the same politician who ordeted the execution of an inmate with such a low IQ that when he was asked about his last meal, he stated that he wanted it saved for later. Many ..including the pope ..protested this execution. Clinton them boasted…to white audiences .about this execution to show how tough he was on crime. Clinton..and his wife as a leading advocate..also pushed thtough NAFTA. which lowered the barrier for corporations to move opetations to low wage countries and exploit their workets in sweat shop operations..at the expense of American workers. I am not a fan of the Clintons..and i don’t think that i can bring myself to vote for another one. Bernie Sanders was a Representative from Vermont until he became a senator in 2006. Vermont is one of the whitest states in the country. Bernie just became national. Hillary was a first lady in Arkansas and a Senator in New York. States with sizable black populations not to mention first lady of the United States. We are in the richest country in human history yet we have folks drowning in debt because of Healthcare and Education. HEALTHCARE AND EDUCATION!! Two of the most important aspects of a decent life. That is simply wrong. And Hillary's plan to make these things more "affordable" is simply not good enough and weak as hell. Not to mention a terrible negotiating starting point. I never thought of LeBron as attractive until I saw this gif. Damn he looks good. It must the lighting and the hat.